We normally play bingo to relax, and because we enjoy it. It's good simple fun. As for the football, well, it can often be none of those things. But still we find ourselves hooked on this World Cup, and hope that England go all the way. We're glad to find that Mecca bingo are supporting the lads too – this is one bingo promotion you'll not want to stay on the bench for. If football's the beautiful game, then bingo must be the beautiful hobby. Whether you like both or not, Mecca are giving you the chance to lift a bingo trophy on every England match day. Given we're still in the tournament and through to the knockout stage, let's hope this promotion carries on right until the final. 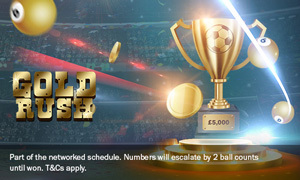 With England Escalator Jackpots, whenever our lads take to the pitch, you can play for a £5,000 escalator jackpot in Gold Rush. This jackpot increases by 2 balls per hour as of 6pm until it's won. When it drops, you can win either 50% of the pot, or grab a community share. Our next match is on 7 July, so be ready then. You must be in the Gold Rush area. When the jackpot drops, you need 6+ active tickets for a share. We've got Sweden in the quarter finals. If it gets too much on 7 July and you watch our game through your fingers, head over to Mecca bingo to unwind. The prospect of a £5,000 escalator and England winning might be too much to bear, but it's better than a bingo red card. You must have a minimum of 6 tickets in play for a community share. A £5K escalator jackpot is up for grabs each day that England play in the World Cup. The next promotion is valid then from Saturday 7 July until Saturday 7 July. Until it is won, the ball call count will increase by 2 balls per hour.